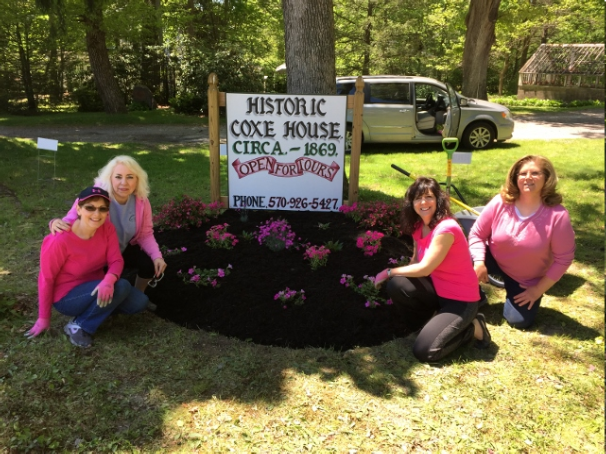 The Hazleton Area Garden Club, Garden Club Federation of Pennsylvania, District II / III, Central Atlantic Region decided to do a “Plant it Pink” project this year.We have partnered with the Historic Coxe House in Drifton, Pennsylvania. In late spring, we planted raspberry blast petunias, cheddar pink dianthus, firewitch dianthus, hot pink phlox, petticoat New Guinea impatiens and two sonic bloom pink wigelas in front of the entrance sign to the historic home. Recently, we added pink mums and also an angel statue because Sophia Coxe was known as the Angel of the Anthracite.We also received the Ames tool grant, as you can see the cart in the second photo.Our local newspaper published a very nice article and photo outlining the details of this wonderful NGC project. Pictured in the spring photo, L -R: Chris Leskosky, 1st VP GCFP, Chris Gresh, Co-chair., Cindy Layton, Chair., and Sandy Visintainer, Hazleton Area Garden Club president. We thought this was a super project! Next Article Next Article: 2016 National Garden Clubs, Inc.